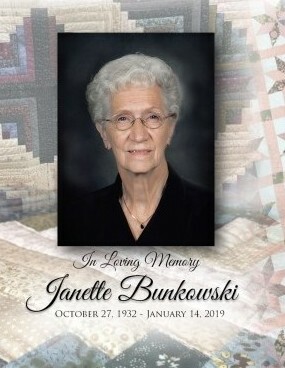 Janette Bunkowski was born October 27, 1932, in Detroit Lakes, MN, the daughter of Edward and Edith (Emery) Glawe. 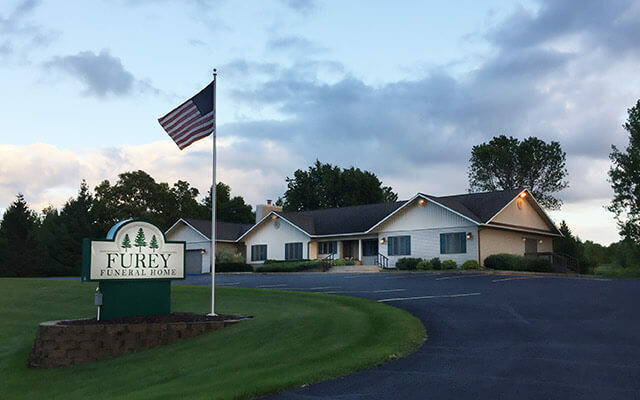 She passed away Monday, January 14, 2019, at Oak Crossing Nursing Home in Detroit Lakes, MN. She was baptized and confirmed at Zion Lutheran Church in Detroit Lakes. Janette grew up and attended country school in Candor Township. She graduated from Frazee High School and continued her education attending a two-year program at Moorhead Teachers College. On August 1, 1952, she was united in marriage to Donald Bunkowski at St. John’s Lutheran Church in Vergas, to this union five children were born. They began farming in Foxhome, MN. In 1960, they moved to Vergas and farmed until retirement. 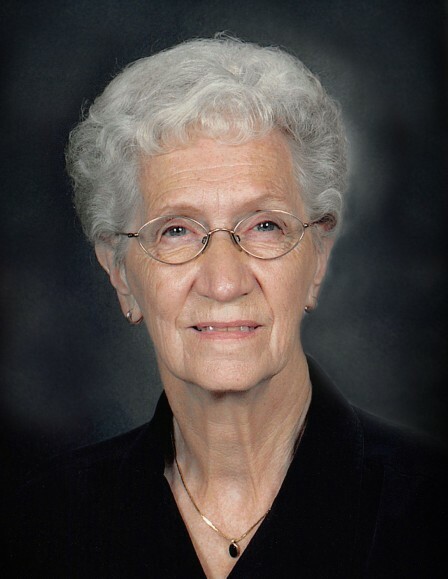 Janette was St. John’s Church organist for more than 20 years, superintendent of the Sunday School and active with LWML serving as President for several years. As a founding member of the Attic Shoppe in Vergas, she became well-known for her knitted sweaters and her unique designs. Janette enjoyed sewing, quilting, gardening, and spending winters in Texas. She is survived by her loving husband of 66 years: Donald Bunkowski of Vergas; children: Terry (Julie) Bunkowski of Sartell, MN; Tom (Karen) Bunkowski of Vergas; Scott (Karen) Bunkowski of Fountain City, Wisconsin; Jodi Kako of Park Rapids, MN; 14 grandchildren; several great grandchildren; brother: Clyde Glawe of Vergas. Janette was preceded in death by her parents, Edward and Edith Glawe; and son, Todd Bunkowski.